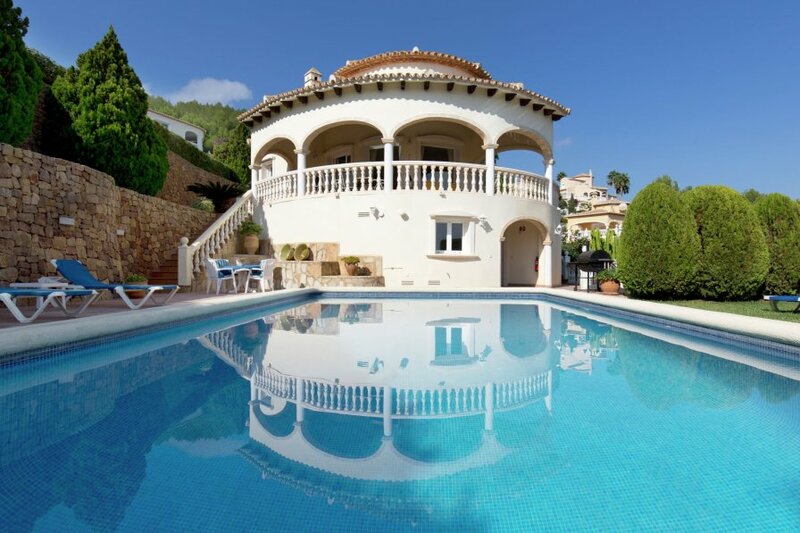 You will stay in this very atmospheric, detached holiday villa in the beautiful La Sella golf resort, only 6 km away from Denia. Tasteful and very neatly decorated holiday home with all the comfort and space you may need. When you pass through the French doors from the living room with fireplace, you will find yourself on the covered (and fenced-off) terrace with an unforgettable view on the Montgó mountains, the golf course and the sea. Via some steps you reach the lower private swimming pool with diving board, which is just waiting for you to dive in. The Moorish castle of Denia, built on a hill in the eleventh and twelfth centuries, is definitely worth a visit. After that you can enjoy strolling through a tangle of streets in the old city and don't forget to visit the nice bustling harbour, full of sailing boats, fishing boats and ferries to Ibiza. You will find the restaurant and supermarket on the resort, only 500 meters away. The 27 hole golf course has a superb location, with a view of the mountains. Orange, olive, and almond trees grow next to the course. The splendid Valencia with it's many cultural buildings and museums is 100 km away. In the capital of paella, your choice of meal is easily made.